Neuroscience Research Australia’s (NeuRA) Prof Kaarin Anstey is part of the Global Council of Brain Health (GCBH) a collaborative of the American Associations for Retired Persons (AARP). The AARP is America’s largest not-for-profit, and nonpartisan organisation dedicated to empowering people aged 50 and older to choose how they live as they age. They also develop networks and form coalitions within the worldwide ageing community, promoting the well-being of older persons internationally through advocacy, education, and service. The GCBH recently released their 2017 Brain Health and Nutrition survey. This survey aimed to identify the eating habits of adults aged 40+, understand barriers to healthy eating, and explore the impact of diet on brain-health in older people. The report is based on findings from an online survey of a nationally representative sample of 2,033 Americans aged 40+. Read their key findings and dietary recommendations below. Adults who eat the recommended amount of fruit and vegetables report better brain health and have a higher average mental well-being. Most adults aged 40 years and over are not getting proper nutrition. Nearly nine in 10 participants said they would eat a healthy diet if they were aware that it could reduce their risk of cognitive decline, heart disease, or diabetes. Only 10% of participants reported that their doctor recommended a special eating plan to them. Women eat better than men – twice as many women than men eat the recommended amounts of both fruits and vegetables. Adults aged 40 or older who eat fish/seafood in a typical week, but not red meat, reported better brain health reported better brain health. Most adults say they are likely to change their diet in specific ways knowing it is good for their brain. Adults aged 65 and older are more likely to change their diet than those aged 40 – 60. 5 – 7 servings of grain foods. 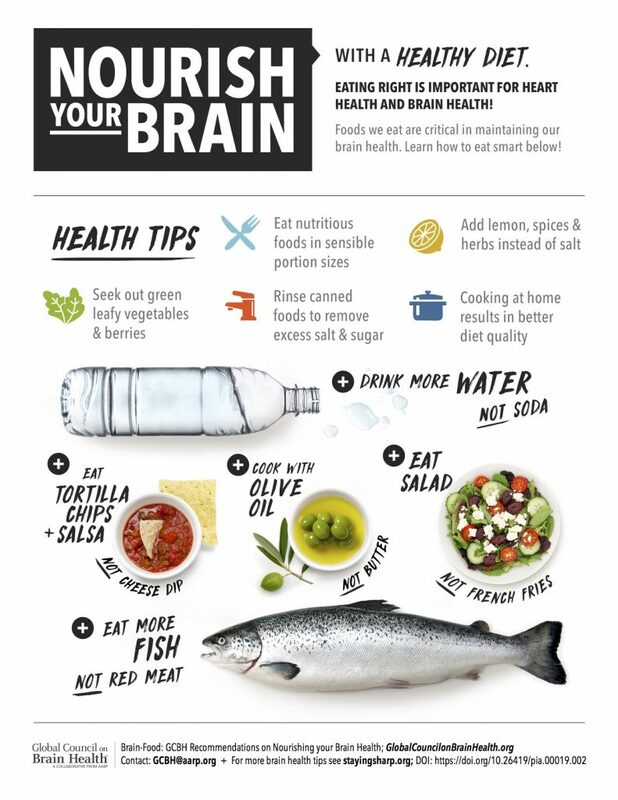 Adults who eat fish/seafood and raw nuts are significantly more likely to report better brain health. To view the full GCBH report, click here. Thanks for sharing a nice information regarding to brain diet. Thanks sir. Lovely information, very true and effective. Thank you for providing this information it was really helpful for me. I got to know that we should properly handle stressful situations for healthy mind.